The leadership process has three components: the leaders, the followers and the situation. These eight leadership theories vary in their consideration of these components. Strengths: This theory started the scholarship of which traits and characteristics build great leaders. Weaknesses: This theory lacks scientific validity and only considers men in power. And, as 19th century-sociologist Herbert Spencer argued, great leaders may be shaped by their society, not the other way around. 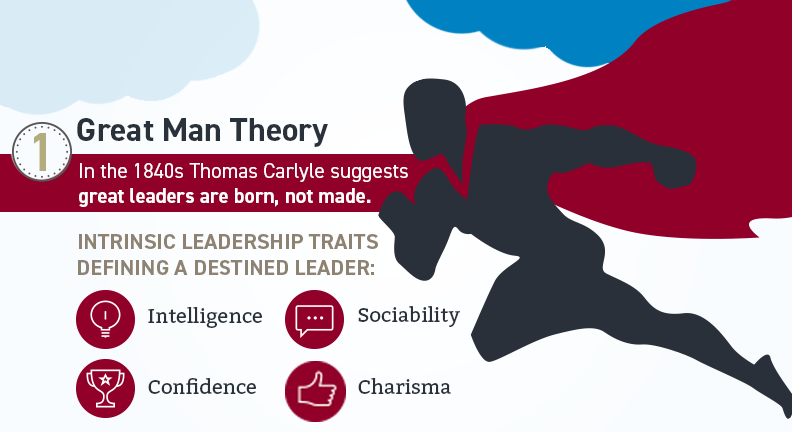 The Traity Theory only considers the leaders as the driving force of the leadership process, so the leader possessing certain traits is critical to having effective leadership. Strengths: This approach is intuitive and understandable. It also has over a century of supporting research. Weaknesses: The trait list can be endless, unclear and subjective. This approach fails to take situations and followers into account, and it’s not useful for training purposes. 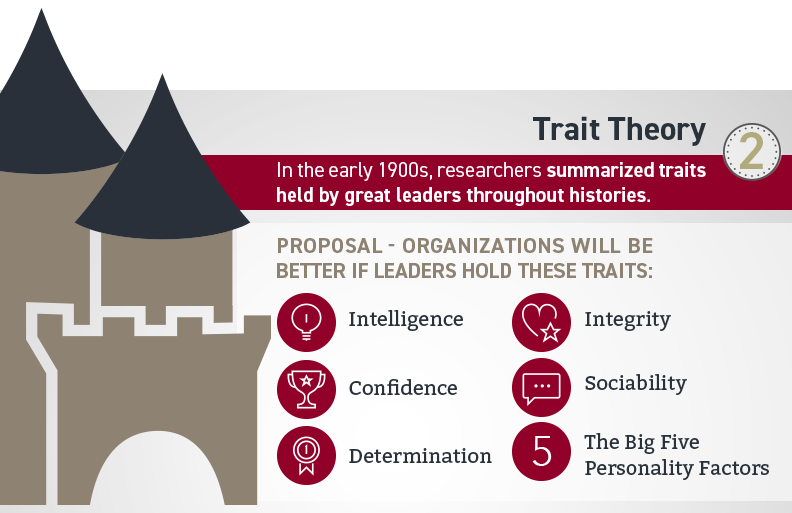 Also, the characteristics attributed to leaders throughout time have been masculine, leading to a biased list of traits that make up a leader. Relationship behavior: helps followers feel more comfortable around the leader and about the organization. Impoverished Management: With low regard accomplishing tasks or creating a motivating team environment, impoverished or “ineffective” managers are mostly ineffective. Country Club Management: This style of manager is mostly concerned with the needs and feelings of team members, thinking that if team members feel happy and secure they will work hard. In country club or “accommodating” management the work environment is fun and relaxed, but productivity suffers due to a lack of direction and control. Middle-of-the-Road Management: These “status quo” managers try to balance people and results, but due to the constant compromise, they fail to meet people’s needs and deliver mediocre performance. Authority-Compliance Management: Also known as “produce-or-perish management,” in this style people’s needs are secondary to productivity. The manager typically has strict policies and procedures and utilizing punishment to motivate team performance. Although this style can result in initial productivity, retention is an issue. Team Management: The most effective of all the styles, “sound” managers prioritize both team members and productivity by making sure team members understand and are committed to the organization’s purpose and goals. 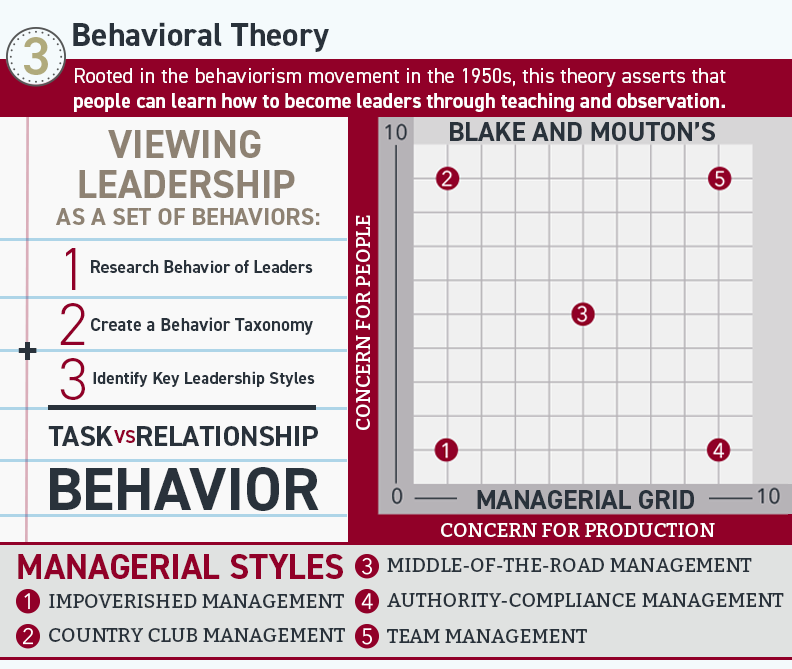 Strengths: This theory expands views of leadership from trait-based to action-based, which makes it easier to teach. It also has strong research support. Weaknesses: This theory is not linked to desirable work outcomes, and no universally successful behaviors have been identified. Also, team management may not always be best despite claims. 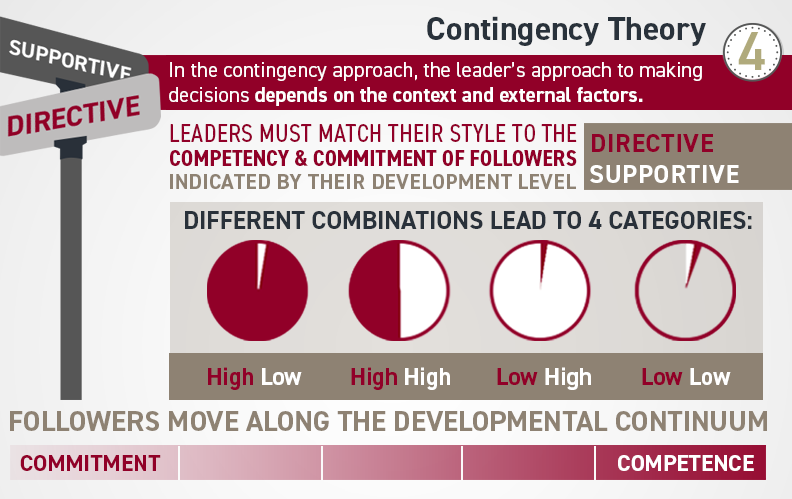 The contingency theory states that followers move along the developmental continuum, which has four development levels indicating the degree to which a follower has the competence and commitment necessary to accomplish a goal or activity. An effective leader determines where followers are on the developmental continuum and adapts his or her leadership style to match. Strengths: This theory is well-known, easy, intuitive and practical to use. 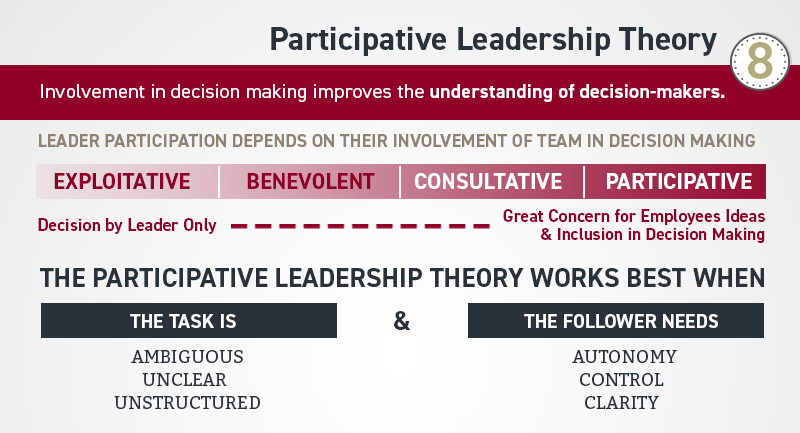 It is frequently utilized in leadership training and promotes tailoring follower treatment based on development. This approach is also prescriptive, meaning that it tells you what should or should not be done depending on the situation. Weaknesses: This theory lacks research support, and there is ambiguity in the development levels. The approach also fails to address demographic differences and how they influence prescriptions. 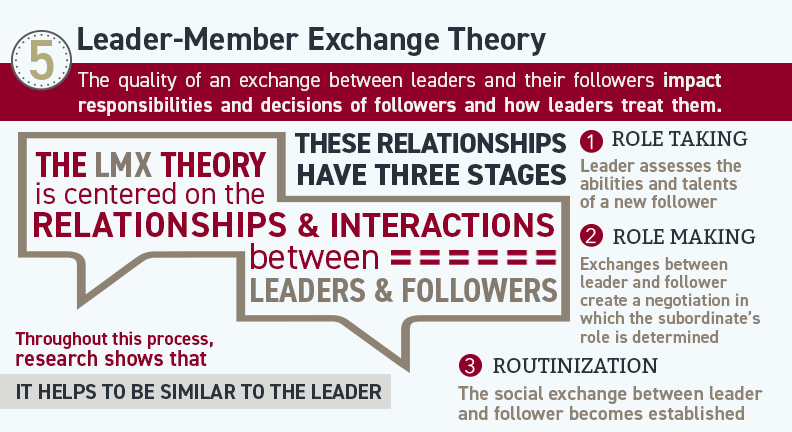 The Leader-Member Exchange Theory (LMX), originating in the 1970s, is centered on the relationships and interactions between leaders and followers. Other factors that affect the quality of the LMS relationship include the challenge of the job, the size of the group, the workload and the financial resources. Strengths: This approach is intuitive and well-researched. Transactional leaders set clear expectations for subordinates for their duties and rewards. Weaknesses: The primary limitations of this theory are that it simplifies people’s motivations and emphasizes the importance of monetary reward while ignoring the rest of Maslow’s Hierarchy. Inspiring team members to follow your vision is essential for transformational leaders. 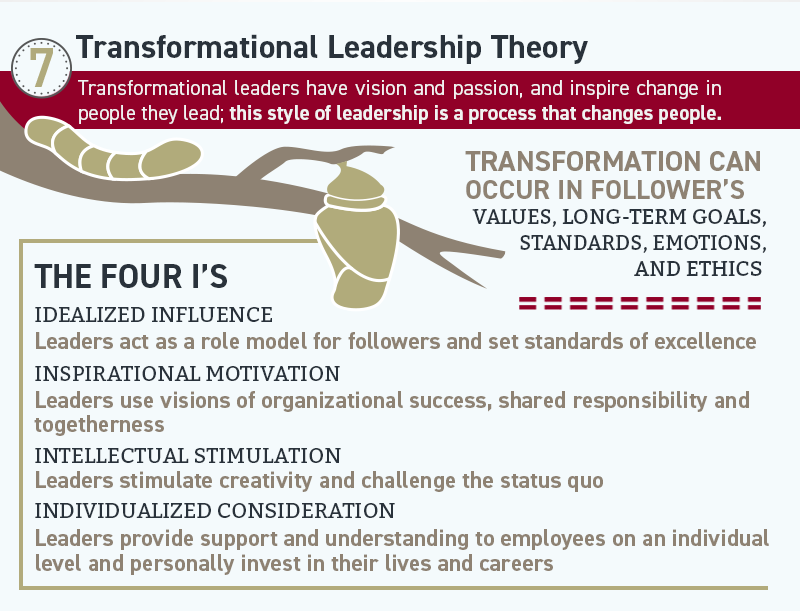 Strengths: Transformational leaders can turn around a company with low morale and accomplish cross-organizational goals by unifying team members under one vision. Weaknesses: Visionaries can lack specification and actionable goals. Strengths: Team members feel valued and they can perform even when the leader isn’t there. Weaknesses: Decision making can take a long time, and there is a social pressure to confirm with the group’s decision.